Acclaimed as “the finest jazz scatting vocalist on the West Coast” (Good Times, Santa Cruz, CA), Nate Pruitt has developed his unique style over a long and varied career. The master of jazz, blues, and popular vocals that you hear in Nate today is the result of a long and multifaceted musical education. 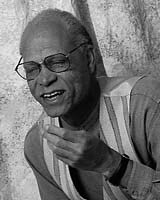 Nate grew up in New Haven, Connecticut, in a musical environment; his brother Willie Ruff is a renowned jazz performer and educator. Across the street from his home was a jazz club, and one summer evening when Nate was around eight or nine, amazing singing drifted across on the warm air. The club’s bouncer wouldn’t let young Nate in for a closer listen, but Nate knew then that singing was what he wanted to do with his life. Though the name meant nothing to him at the time, the singer turned out to be Lena Horne. As a teenager, Nate performed professionally in a doo-wop vocal group. Formal studies at Boston’s Berklee School of Music followed, and then a stint in the Army fronting a band that included Phil Upchurch and Keith Copeland. After the Army, Nate worked for a period in New York City, where he was under the tutelage of Carmen McRae. Another wave of wanderlust took him to Los Angeles, where he recorded with Quincy Jones. Since the early 1980s Nate has been a mainstay of the San Francisco Bay Area jazz scene. His singing has been featured in numerous movies (including The Lost Man with Sidney Poitier and Mad City with John Travolta and Dustin Hoffman) and commercials. He has appeared at the Monterey Jazz Festival, the Monterey Blues Festival, the Berlin and North Sea Jazz Festivals, and the W. C. Handy Memorial Jazz Fest in Alabama. And he has been blessed to perform with so many wonderful musicians, including Dizzy Gillespie, Diane Schuur, Dave Brubeck, Carmen McRae, Quincy Jones, Lionel Hampton, the Mitchell/Ruff Duo, Ernie Watts, and John Abercrombie. Nate lives in Morgan Hill, California, and shares his love of singing with students he teaches both privately and at Gavilan college in Gilroy, California. Best of all, Nate’s musical talent has been passed down to his two sons, Nate Jr. and Miles, and daughter, Laura – all gifted artists in their own rights.